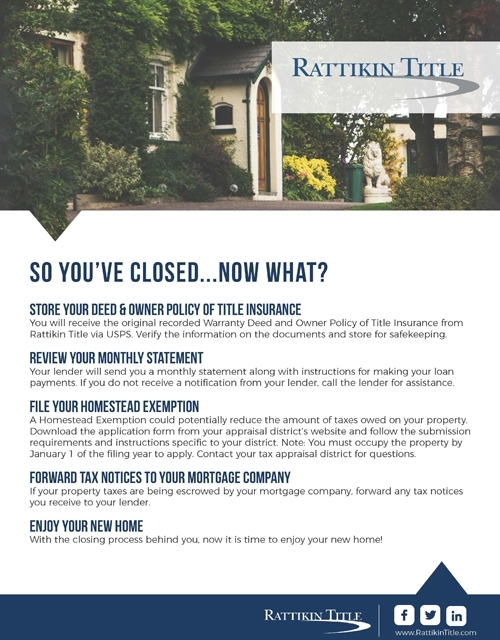 You will receive the original recorded Warranty Deed and Owner Policy of Title Insurance from Rattikin Title via USPS. Verify the information on the documents and store for safekeeping. Your lender will send you a monthly statement along with instructions for making your loan payments. If you do not receive a notification from your lender, call the lender for assistance. A Homestead Exemption could potentially reduce the amount of taxes owed on your property. Download the application form from your appraisal district’s website and follow the submission requirements and instructions specific to your district. Note: You must occupy the property by January 1 of the filing year to apply. Contact your tax appraisal district for questions. If your property taxes are being escrowed by your mortgage company, forward any tax notices you receive to your lender. With the closing process behind you, now it is time to enjoy your new home!